The Gordon Elliott-trained Champagne Classic, owned by Gigginstown House Stud, was a ready winner of the Martin Pipe Conditional Jockeys' Handicap Hurdle. Always travelling well under J J Slevin, the six-year-old son of Stowaway kept on nicely after the final flight to score by two and a quarter lengths from Philip Hobbs' Verni in second. Champagne Classic's stable companion Runfordave was a length and a quarter back in third with a further half-length back to Nick Williams' Coo Star Sivola in fourth. The gelding's victory sees Elliott take over from Willie Mullins at the top of the Irish Independent Leading Trainer Award standings for this year's Festival, with both handlers having six winners, but Elliott has had three seconds against two for Mullins. Elliott said: "I'm delighted. 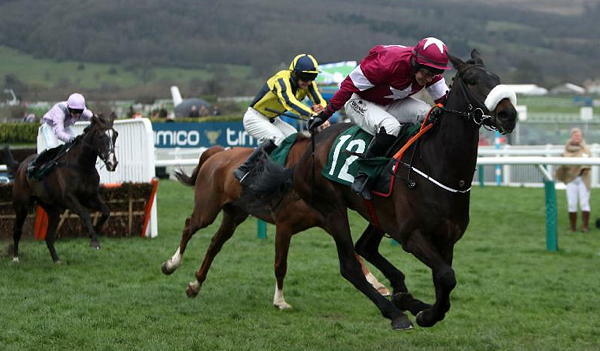 To have six winners at the Cheltenham Festival is special. It's unbelievable and I just can't believe it - it's brilliant." Michael O'Leary, owner of Gigginstown House Stud, said: "I think that was a miraculous event. He is probably the worst horse we own! We buy them in numbers and you get a few duds - he is one of the duds! "However, it means a lot to Gordon to win this race as he has wanted to win it for many years. He will really enjoy that. "J J gave him a great ride and it's good for him. He is a very good young jockey in Ireland. I don't know much about him. I know he has ridden a couple of winners for us." Phillip Hobbs, trainer of second-placed horse, said: "He's run really well, he is probably still on the up a bit and the two-and-a-half miles suited him better. Tom Cheesman, jockey of the second, added: "He travelled well, maybe a bit handier that I wanted but I thought it was important in that race to be as handy. He has travelled all the way through the race." "I saw the winner come up on the outside and ideally I wanted to get a tow to the last and then take it up, which is what we did. We have just been beaten by a better horse on the day. He has run really well and hopefully it will be something to look forward to?" JJ Slevin picked up a first Festival victory when guiding Champagne Classic to win the Martin Pipe Conditional Jockey's Handicap Hurdle. The Gordon Elliott-trained 12/1 chance beat Verni by two and a quarter lengths. "This means the world. It's something I've dreamed about from a very young age - when you are young riding ponies and messing about in fields, this is where you want to be, and this is something I thought would never happen. "I got the ride yesterday. Then other people rang me wanting to ride their horse, and I tried to get off Champagne Classic, but luckily Gordon wouldn't let me! I was very lucky he didn't. "Champagne Classic's a fine, big, scopey horse who was the winner everywhere, jumping and travelling well. "Gordon has had an unbelievable week and it is a privilege to ride for him. "My father trains at home in Wexford and I started riding his point-to-pointers. He's stood by me the whole way and I owe him an awful lot. Joseph O'Brien has been very good to me this season - he's got a lot of exciting jumpers there. "I turned professional last September and I genuinely thought I wouldn't have a ride here this week. It's unbelievable putting these colours [those of Gigginstown House Stud] on my back. I broke my ribs about a month ago and only started riding again last Thursday."